Question: Mark, I have an outdoor spigot that is leaking from the cap on top of it. Can you explain how do I repair a Silcock when it leaks from the cap on top? Answer: Elise, It is the vacuum breaker that has probably failed/worn out on the Silcock, or more specifically the vacuum breaker float assembly. 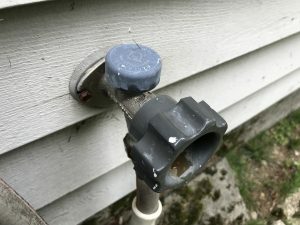 It is a tiny rubber disk underneath the plastic cap that is forced up each time the outdoor spigot is turned on, and is supposed to fall down when the valve is turned off. With most silcocks you can relatively easy replace the rubber disk inside the Vacuum Breaker. First turn off the Silcock and pry off the vacuum breaker cap. Then slightly tighten the plastic nut with a pair of adjustable pliers. Then turn on the Silcock and see if the leak has stopped. If the leak persists, then turn off the silcock again, as well as the water to the outdoor spigot from inside the house. Next, pry the vacuum breaker cap off of the spigot with a common screw driver. Then remove the breaker retaining nut with a pair of adjustable pliers. Now remove the vacuum breaker float assembly with your fingers. Examine it and clean off any gunk or debris that is on it with a rag and rinse it off with water. Mineral deposits on the assembly may be causing the valve/washer assembly not to seat well. So if you see any hard mineral deposits on the valve carefully scrape it off with the common screw driver. Reinstall the vacuum breaker float assembly and reattach the retaining nut. Then snap the cap back on and turn on water to the spigot and then turn on the silcock to see if the leaking has stopped. If not, remove the vacuum breaker assembly again and go to a home improvement center and find a replacement part. Make sure to bring the vacuum breaker and retaining nut with you to compare with the replacement part. Then install the new vacuum breaker replacement part onto the silcock and try it again. With any luck the silcock vacuum breaker leak will be just a memory.